Ardee Community Centre, Co. Louth. Competitors must be pre-entered. The entry form is available on our website. W.K.F. rules will apply. 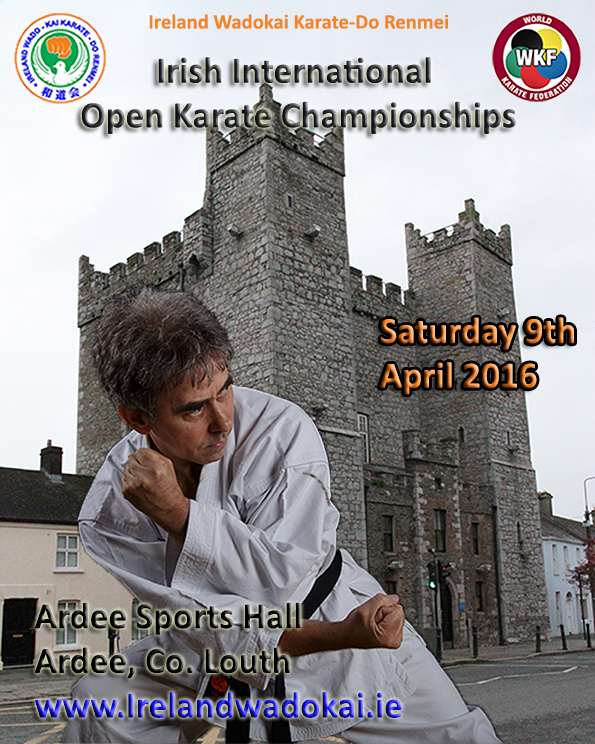 Ireland Wado Kai Karate-Do Renmei reserves the right to alter the list of events and/or the rules of this competition without notice. Competition officals will not amend incorrect entries and may amalgamate categories if entries are deemed to be too low. Contestants entered in the wrong category will be disqualified. Andy Simpson, WKF European Referee (Scotland), will be chief referee. Clubs are asked to provide referees and/or judges. All referees and judges must be qualified and insured. All over 12’s must wear protective equipment as in WKF rules. There can be exceptions made for smaller children. Competitors must bring their own red and blue belts and their own red and blue mitts. All competitors must produce a valid karate license and insurance when registering. Referee meeting 9.20am. Coaches meeting 9.45am. Events start at 10am sharp. Hot and cold food and drinks will be available throughout the day.